The council has been wrestling for months on ordinance amendments that would further restrict the occupancy of rental houses. A state law passed in 2015 probibits basing limits on the number of bedrooms, and several towns have turned to square footage, including Southern Shores, which set the number at 6,000 in 2016. But last year, two houses now under construction on the Southern Shores oceanfront were designed for 12 bedrooms within the square footage limit and include theater rooms and other amentities aimed at weddings, reunions and other large gatherings. Faced with mounting public pressure, planners in Southern Shores put together several alternatives, including limits based on septic capacity. Because the changes were zoning text amendments, the five-member council needed a super majority of four votes to approve them. After a vote of 3-2 last week, the council will have to take up the issue again. But on the second reading, it will need only a simple majority. 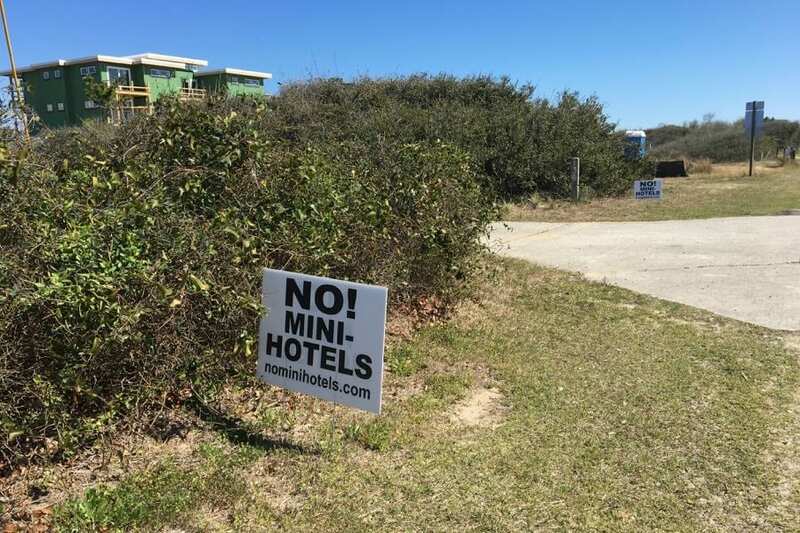 Neighboring oceanfront property onwers, meanwhile, have filed an appeal of a Coastal Area Management Act permit for the two houses being built by SAGA Realty and Construction. One property owner is also challenging construction of one of the houses before the Zoning Board of Adjustment, according to the website nominihotels.com. How did those two monster flat roofed house on route 12 in Southern Shores ever get approved. ? You’ve got my vote. No Mini Hotels. Not fair to the existing residents and makes the beautiful OBX look too much like the Other beaches. It takes away from some of the rawness as well.